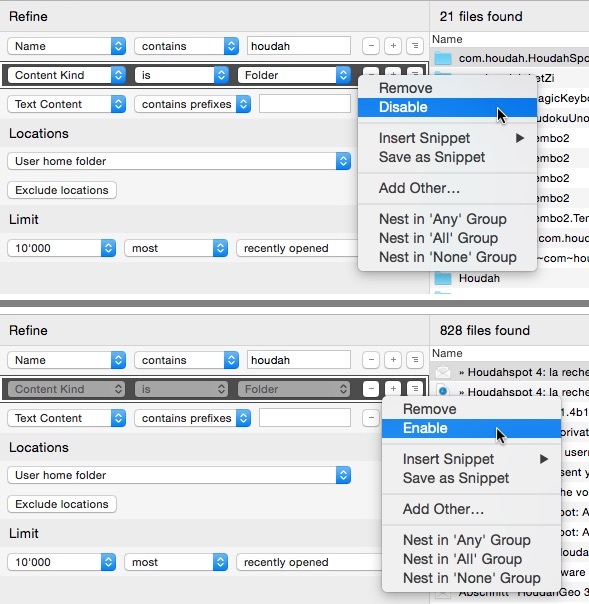 In HoudahSpot, you can temporarily disable individual search criteria. This is particularly useful in combination with templates: have different criteria preconfigured, enable them as needed. To disable criteria rows in HoudahSpot, select them, then either choose Search > “Disable Selected Criteria” from the menu or select “Disable” from the row’s context menu (ctrl-click). Enabling criteria rows works likewise. Now, let’s look at an example on how to use that with templates: Say, you regularly search for photos, but sometimes you’re just interested in images with a width of at least 1’280 pixels. Your new template appears in HoudahSpot’s sidebar and in the Templates menu. 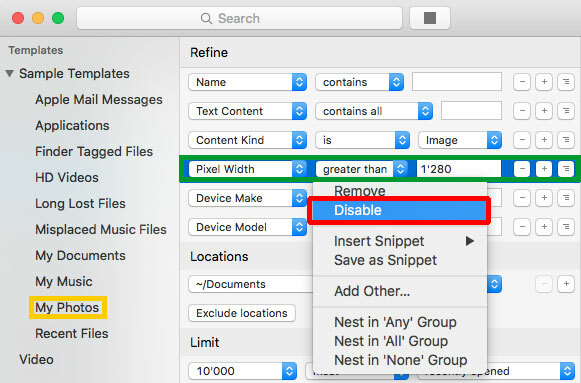 When you use it, the “Pixel Width” criterion will be ignored until you choose to enable it again. You can, of course, include several such disabled criteria in your search template. This is especially useful when the criteria are in conflict. One criterion might restrict results to images larger than 1’280 pixels, while another one matches smaller images. When using the template, you will only enable one of the two criteria.